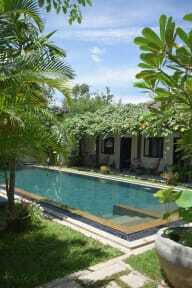 A social hostel that offers a beautiful garden environment just a short 1km from Siem Reap’s Pub Street. 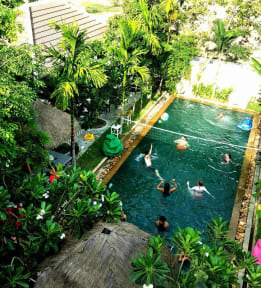 Set amongst the fauna you will find a large, well maintained, pool area which coupled with our awesome bar and restaurant is perfect for escaping the Siem Reap heat. Each dorm features a boutique private bathroom and all have a garden and pool view. Our dedicated staff keep this hostel a safe and clean place to stay. For those looking to enjoy all sides of this laid-back city; Yolo Hostel can provide transport to the temples and circus/bus tickets. We can also help our guests ‘let their hair down’ by taking them to our big sister bar. Yolo Bar is located on pub street and has consistently been known as the best party in town. We also have games available to play including; beer pong, pool volleyball and board games. We opened our doors to backpackers in May 2018 and our hostel family is growing every day. Free WiFi, comfy rooms, pool, bar and restaurant. What more could you want? PS. Please be aware that some tuk-tuk drivers at bus stops and the airport will claim a hostel or hotel is closed. This is untrue and they are trying to get you to stop at another place for a commission. Me and my 2 friends stayed here for like 5 days and we had the best time! The staff was so nice and it was just a great atmosphere. We felt very welcome and happy the whole time. Keep the work up guys and big kisses from your Belgian friends! We verbleven in dorm 1. Kleine kamer met toch nog 18 bedden erin. Nadeel, het zat vol en niemand kon zijn backpack echt kwijt. 1 toilet en douche. Toilet rook de meeste tijd naar urine helaas. Tours vanuit het hostel zelf waren duur dus kijk even in de stad voor goedkopere opties. Verder prima voor 1,71 euro per nacht.